Open the cabinet doors and empty out the contents and set aside. Mix a mild soap and water together in a small bucket. Wash the insides of the cabinets using the soap solution and a sponge.. Dry off the soap and water with a towel. Close the cabinets and put some oil soap in a container with water. Test it on an inconspicuous part of the cabinet to see if it could be harmful to the finish. Dip the sponge in it. The sponge should have a soft side and a scouring side for best results. Wipe the surface of the cabinets with the sponge. Use the scouring side for grease or other material stuck to it. Rinsc frequently so you don't reapply dirt that you already removed. Dry the cabinets with a clean, lint free cloth. Doing this will remove any moisture and residue. 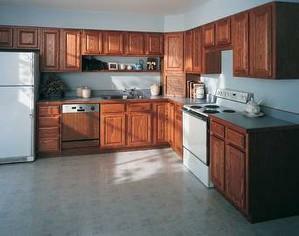 Reapply wax or polish to make your cabinets shine!